Ken Levine talks music composers and development secrets in an extended Reddit session. 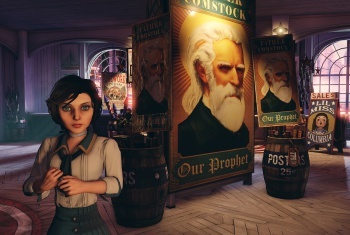 Fortunate Reddit users got to ask Ken Levine, creative director of BioShock, pretty much anything, and Levine let slip some interesting scraps about his latest game, BioShock Infinite. The one piece of information sure to please fans of the original's soundtrack, is that Garry Schyman, composer for both the previous BioShock games, returns to the composer's chair for BioShock Infinite. But Levine didn't stop there. He started talking about the game's backstory, and what will make it different than the previous games. Without wanting to spoil, Levine said, the past will matter a great deal in Inifinte. Except that "where the last game was about Archeology," Levine added, "this game is also about Anthropology, in other words, you get stories from both the living and the dead in Infinite." Levine's challenge is to make a sequel that isn't a sequel. "We knew BioShock is really a hard game to sequelize," said Levine, while acknowledging that corporations like to make money from franchises. "There's no real standard formula," Levine added, "and if you use a standard formula, the fans are going to be turned off. So, in other words, we invented a franchise that is nearly impossible to sequelize." However Levine did go on to say that there was a formula, as such, for BioShock. Step one: make sure it takes place in a world that is grounded in reality and fantastical. Step two: combat has to have a strong improvisational nature, allowing players to tackle each fight in a different way. But those are just the bare bones of a BioShock game; the heart of it was love. "I can't imagine doing it if we weren't in love with the idea," Levine said. BioShock Infinte, the latest entrant to the series, is due out in 2013 for PC, PS3 and Xbox 360.